On the evening of November 5, the “Always Remember Them – Concert on the Works of Famous Song and Lyric Writers of Modern and Contemporary China” was presented jointly by China Central Conservatory of Music and the Symphony Orchestra of Goldsmiths College, University of London at Cadogan Hall. The concert was hosted by the Organizing Committee of the Exhibition “Contemporary Chinese Seals by Li Lanqing” and the Hanban/Confucius Institute Headquarters, and was organized by the Goldsmiths Confucius Institute for Dance and Performance, University of London. Cheng Siwei, Vice Chairman of the Standing Committee of the Tenth National People’s Congress, Vice Minister of Commerce Zhong Shan, former Vice Foreign Minister Wang Yingfan, Zhao Weisui, Vice President of China International Culture Association, Liao Xiaoqi, Chairman of China World Trade Centre, Li Zhiqun, Chairman of the Supervisory Board of State-owned Key and Large-sized Enterprises, the State Council and Cong Peiwu, Charge D’affaires of the Chinese Embassy in the UK, attended the concert. Over 800 spectators from the educational, cultural and business communities with strong interest in Chinese culture watched the performance. The concert was held in respect and honor of the outstanding song and lyric writers and musicians in the modern and contemporary music history in China under the initiative of Mr. Li Lanqing. It is one of a series of events of the “Contemporary Chinese Seals by Li Langqing”. Before the concert, the leaders of the Organizing Committee and Hanban/ Confucius Institute Headquarters presented to five universities and five secondary schools in Britain Mr. Li Lanqing’s book Li Lanqing’s Essays on Music in Modern and Contemporary China (English version). 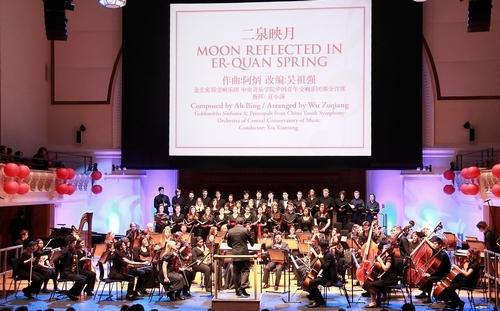 The concert was directed by the famous young conductor Xia Xiaotang of the Central Conservatory of Music, and the prestigious professor of the Goldsmiths College, Such as Professor Alexander Ivashkin and Professor Tim Hooper served as artistic directors. The performers were mainly the young teachers and students of the Central Conservatory of Music and the members of the Department of Music, Symphony Orchestra and Chorus of the Goldsmiths College. At the concert, the works of the talented and remarkable song and lyric writers in the history of music in modern and contemporary China were played by the Goldsmiths Symphony Orchestra with great oriental charm or sung by the Chinese and British students in Chinese. The performance was warmly welcomed by the audience.